Note: This is Book 4 in the series and it definitely works best if you have read the first 3 books. This series keeps getting better and better. 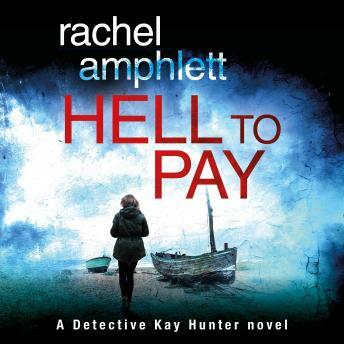 I really enjoy Kay Hunter and in this book she has the chance for a bit of well-deserved vengeance. In the previous 3 books, there has been this over-arching mystery that hasn’t been a part of the main mystery to each individual book. Well, now all those little bits have come home to be a part of the big main mystery in this novel. It’s been a delicious slow burn and Hell to Pay was worth the wait. Kay’s team really pulls together to go after the Albanian crime lord Dimitri. Alas, someone higher ups pull rank and they are pushed to a secondary, support role by this new jerk, DCI Harris. He’s not quite the same cut of cloth as DCI Larch (who’s always tearing someone apart), but he definitely has some issue with Sharp (Kay’s boss). So, right here in this one paragraph, we have all the people who are causing Kay headaches (minus Sharp). Even though Kay’s husband Adam has to be out of town for a veterinary convention, her co-workers have her back. Barnes and Gavin and Kariss (fellow detectives) and her immediate boss Sharp all know her personal beef with Dimitri. They take turns making sure Kay doesn’t go Lone Wolf. I’ve really grown to love these secondary characters, especially Gavin. The story was the perfect balance of action and detailed sleuthing. Both are important for closing the case and Kay’s team gets that. Harris and his team – perhaps they need a refresher on how to play well with others we well as proper police procedure. As if nailing Dimitri isn’t enough work, Kay’s team as this inter-departmental feuding going on. It was all well done; I never got bored because there was always some new obstacle for Kay to take on. The ending had a good solid punch even as it opens up the door for perhaps another long running mystery, this one concerning one of Kay’s coworkers. All told, 5/5 stars. The Narration: Aliso Campbell did well with this book. Her male voices were much better, each being distinct and almost always masculine. Campbell is still an excellent Kay. I loved how she handled all the touch emotions in this book. There were no recording issues. 4/5 stars.